Over the last couple of months, IHB has teamed up with Global Decision to prepare an accurate and in-depth analysis of the Irvine housing market. Today's post is the first in a series that will illuminate the workings of the local market in a whole new way. Data is important, isn't it? It's a shame the NAr has gone down the path it has. Few reliable sources of real estate analysis and information exist, and few signs the NAr is going to become one of them. That leaves a void. Uncharted waters buyers must navigate without a reliable guide. It's a void we seek to fill here at the IHB. We are in the process of assembling our own private database of housing and related economic statistics. Over the next several weeks as I have time to digest the new information, I plan on a number of new analysis posts to truly illuminate the activity in our local housing market. I have no agenda to spin the data. Let's see what is really going on. I want to be accurate. People can make their own decisions and draw their own conclusions from accurate data. If approached without the built-in bias of a realtor, data analysis can be revealing rather than deceiving. I will still have a dog in this hunt. I do run a business that makes money from real estate transactions. I am subject to the same biases as any other human being. I sell real estate, but I am not a realtor. The truth needs no salesman. I will present data as accurately as I can. If reality motivates you to buy or rent, the IHB can help you. I have no desire to manipulate data in order to make a quick buck. This is a part-time hobby for me, not my livelihood. After that post aired, I was contacted by Jaysen Gillespie of Global Decision, an analytics and consulting firm that has worked in the real estate industry. He shares my interest in determining what is really going on in the real estate market. As a professional data analyst, he is trained in special techniques I cannot perform. In the weeks that followed, we have met several times and with the assistance of another data analyst, Brian Nadel, we have performed an in-depth analysis of the Irvine housing market. Today is the first in a series of posts on our findings. Today's post lays the groundwork for the detail to follow later. The basic model Jaysen developed is complex, and we felt it deserved a post on its own to ensure everyone understands what we did and why it is better than other measures of value currently available. The following is the writing of Jaysen Gillespie. I have not set it off in block quote to make it easier to read. Today’s post is an example of such an application, known as hedonic housing valuation. The goal of a hedonic housing valuation model is to use all information about a sale, including both the sale price and the characteristics of the home (number of beds, number of baths, square footage, etc.) to understand how the home’s value is derived from its constituent parts. Wikipedia offers a good overview of hedonic regression. Unlike looking at comps, which relies on a small number of highly similar properties, a Hedonic model incorporates as much data as possible from a vast number of properties. The core mathematical construct behind a hedonic valuation model is a multiple regression, and for such regressions to produce statistically meaningful results, it’s helpful to have a large number of sales as inputs into the model. In non-technical terms, the regression procedure figures out how to best fit the values of all the pieces of a home to build a formula for the value of a home based on the characteristics of the home. A simple linear hedonic valuation model might, for example, conclude that each bathroom adds $15,000 of value to a home – or that each square foot of living space adds $250 of value to a home. Such values are calculated based on actual historical sales and represent the regression algorithm’s best estimate given the data. For more details on the mathematics behind hedonic regression, along with plusses and minus of using hedonic models for housing valuation, please see the real estate section of the Global Decision website. All regression methods – and in fact all mathematical models – suffer from one of the same drawbacks: factors not in the model may impact the dependent variable under study. 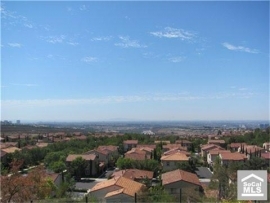 In our example, housing values in Irvine, we might find that properties with an exceptional view sell for a premium. Our housing data does not reflect whether a property has an exceptional view – and our model would likely undervalue that specific home. As it turns out, the Irvine dataset is the best of most possible worlds. The city itself is extraordinarily homogeneous: schools are uniformly good and crime is uniformly low. There are no “bad” areas, by typical American metropolitan standards. This homogeneousness allows us to construct a model that has a very strong ability to understand how Irvine homes derive value from their constituent parts – and is not overly swayed by factors not available for modeling. To further exclude data points that are not representative, we’ve excluded condos, “attached single family” properties. We’ve also excluded properties with unusual characteristics, such as a 15,000 sq. ft. lot, or 7 bedrooms. Unusual properties only represent about 2% of the Irvine sample and don’t detract from the model’s ability to trend home values over time. With the data winnowed down to true resale single family detached houses with no unusual characteristics, we can then run the regression to determine how the value of homes has moved over time. Our Irvine dataset includes sales from 2000 through June 2011. The regression model calculates each quarter’s price change, relative to the initial quarter (2000Q1). Because there are only so many sales each quarter in Irvine, and because regression-based models need a certain number of data points to produce valid results, we are not able to generate a monthly price series of the same quality. Regression models require more data than some other approaches – but they also provide a deeper understanding of the data in exchange. The above chart shows the actual median price for resale SFRs from the underlying dataset, along with the hedonic model’s estimate of how prices for those same properties have moved over time. The key insight is immediately clear: during the years of rapid appreciation, both the median and the hedonic trend were similar. However, between 2005 and 2008, the two series started to diverge and are presently at significantly different values. A second observation is that the hedonic series is much smoother. The median price can gyrate wildly from quarter to quarter, as evidenced by the 10% drop from 2010Q3 to 2010Q4. The hedonic model, by contrast, dropped only 3.0% in the same period. A core benefit of a hedonic approach, versus a median-value approach, is that a hedonic model is not skewed by changes in the mix of product that sell each quarter. As sales move from larger to smaller homes and back again – or from one neighborhood to another – the median value is pushed and pulled by the changes in the mix of the underlying properties. Such changes do not indicate the actual home value trend and serve only to obscure the true change in home values in the mid-term. So what’s driving the gap between the median value and the value implied by the hedonic analysis? As we mentioned earlier, changes in the mix of properties affect the median but not the true trend of real estate values. Foremost among such changes is the size of the median home sold. Clearly, with all else equal, if the homes that are selling increase (decrease) in size then the median value will rise (fall). For this reason, some analysts prefer the “price per square foot” summary metric. That metric also produces distortions, though in different ways. You can see from chart 2 that the median size of homes sold in this particular dataset has risen over time. The rise over time is a general trend, but it also exhibits a visible discontinuity upwards around 2006Q4. Starting in that quarter, about 50% of the quarters have median home sizes that exceed 2,300 – a condition which did not occur between 2000Q1 and 2006Q3. The median home value series is pushed higher by the fact that larger homes are selling. The degree of the distortion is evident in the chart: the gap between the undistorted hedonic index and the median-based index is clearly visible from 2007 to present. The other major factor that drives home values is location (regression models don’t need it repeated three times). Because Irvine experienced something of a building boom from 2000-2007, the percent of total sales represented by newer homes has also increased over time. This change in mix is another reason why using the median home value over time to represent the change in the true value of any given Irvine home yields distorted results. An admittedly-leading question to ponder in the astute observations: if builders create housing that’s physically identical to the average existing housing stock, but those properties sell for a premium for being new, will using the median home value as a price index generally overstate the actual change in value? What if builders create housing with more (or less) favorable characteristics over time? An interesting offshoot of the hedonic model is that one can use its relatively-stable quarter-over-quarter values to better understand whether the current price trend is deviating from historical norms. Home values have a seasonal component to them. Most major indexes, such as the Case-Shiller, offer “seasonally adjusted (SA)” and “non-seasonally adjusted (NSA)” series for this reason. The Irvine hedonic model is inherently not seasonally adjusted. In fact, one can use the results generated by the model to help understand the seasonality of price changes. The following graph shows the average change, quarter-over-quarter, in the Irvine hedonic price trend series. The hedonic model provides solid evidence that prices are generally stronger in Q2, with weakness in Q4. This finding simply confirms conventional wisdom. However, if we couple this fact with the fact that 2011’s hedonic analysis shows a flat trend in Q2 2011, then de-seasonalized trend of Irvine home values in Q2 2011 was negative. Q3, on average, is about 1.8% worse than Q2 – and a typical Q4 is over 4% worse than a typical Q2. Only time (and actual data) will tell if Q3/Q4 2011 will follow these trends, but the implication is that Irvine home values could easily fall 5% in the coming quarters due to seasonal factors alone. If the underlying trend is actually negative, the drop will be exacerbated by seasonality. If the underlying trend is actually positive, the gains will appear muted in Q3/Q4 for the same reason. The Q3 and Q4 editions of the hedonic model will explain which scenario is the case. Stay tuned! The Irvine hedonic housing model does not directly attempt to predict future home values. It does, however, more clearly show the true underlying value trends based on actual sales. Those true underlying trends can then be combined with other sets of data, such as default/foreclosure rates, loan-to-value ratios, job growth, and so forth to create model-based approaches to predict future home values. In that sense, if others can use the hedonic approach to refine their forecasting models, it does have predictive value. When we first poured over the results, I was struck by how the model more accurately showed the decline in value since the peak without the distortion of product mix. I have noted on other occasions that the few transactions occurring in Irvine have been of the most desirable single-family detached homes, and in order to complete the transactions, buyers have put more money down. The hedonic model shows both the increasing size of homes purchased as well those homes being the newer ones. As we will show in future posts, many of these sales have been in Turtle Ridge and Quail Hill were the premiums are astronomical. The flight to quality from cash-heavy buyers is apparent. Armed with this new model, we dove into the details on various neighborhoods and even the components of the housing stock itself: beds, baths, square footage, age, garages. We also looked at condos and rentals. The results will be detailed in future posts. Is Turtle Ridge really that nice? Turtle Ridge is certainly a desirable community. Both rents and house prices carry a premium over the rest of Irvine. Of course, the rent-to-price ratio is still wildly distorted making prices completely unjustifiable on a cashflow basis, but since the market is always right, buyers have been willing to pay a premium on the premium to own here. But isn't there a limit? The owner's of today's featured property bought back in March of 2004. Based on county-wide metrics, they should be underwater. Has Turtle Ridge appreciated nearly 50% since early 2004? Really? If so, the supply of greater fools must be endless. Not that it's a bargain, but for $2,950,000, you can get an Laguna Beach home just off the beach. This entry was posted in Library, News, Real Estate Analysis on June 29, 2011 by IrvineRenter. “Hedonic” is like those clothing-optional clubs.. J/K. Looking forward. -JFPS: “Upgrated” = grated on your nerves and wallet. If it comes with a cute a buns kneader as well (or even a matched pair? ), then it has a vastly increased hedonic value and the price becomes more reasonable! Though maintenance costs go way up as well. Much a do about nothing… As I’ve always correctly stated, January 2009 when the world was ending… was and is still the best time to have purchased in Irvine. Two and a half years of zero appreciation and the likelihood of further price declines…. Hmmmm… That was a brilliant choice. At least there is some acceptance in your response. Well done, nice progress. Speaking for those of us with lots of cash, its been extremely nice renting over the last 24+ months since PR’s supposed bottom. As for mortgage and treasury rates both are UP( though modestly) from their lows in 2010 and 2009 respectively. So I am not sure what point you are trying to make. Assuming that PR meant “best time since the bubble popped” this statement is probably correct, at least for SFRs. As for whether 2009 will continue to be the best time in the future… well that’s the REAL question isn’t it. That’s what I love about PR. Take a more-or-less uncontroversial statement that few people have ever disagreed with, then spin it to claim that everyone else is in denial about the facts. PR, buying in Irvine in 2009 would have been the wrong decision for certain people like myself. I’ve been renting (cheaply I might add) and saving lots of money for that downpayment. When (not if) prices continue to go down in Irvine and other parts of OC, people like myself are in a win-win situation. You can take that to the bank my friend! When I first saw “hedonic”, I almost barfed because of the manner in which the cpi is calculated. It is nice to see that there is an appropriate and valid use. great analysis. capitulation is starting to happen this year in irvine. you see some pretty good discounts with sellers who are serious about getting rid of their property. of course, there are a good number of higher asking prices but those just sit and sit; there are very few suckers this time around. eventually, those type of sellers will capitulate also. We’re going to be approaching 2003 prices soon, across the board, as some of the more undesireable home are already there. Will we see 2002 prices? Don’t know. Unemployment is relatively low for those with useful college degrees. If a recession hits later this year and these type of people get laid off we will see 2002 prices within 2-3 years (that’s a big IF). Yep I’ve been saying that for a long time as well, the flight to quality is apparent. Acceptance of reality is good. Thank you for your interest in this blog post. I’ll be checking in from time-to-time and can address any specific questions that the IHB readership might have. While no method is perfect, a hedonic model gives us another way to roll up underlying data and separate some of the noise from the insights. In my view, hedonic models are underused in the real estate world (at least in the publicly-produced data series) due to their complexity of production. For those of who you whose mind immediately jumps to that long weekend on a tropical beach when you hear “hedonic” analysis, note that “hedonic” and “hedonism” are both derived from the same Greek root word for pleasure. Hedonic analysis attempts to determine the specific elements of a bundled good that produce pleasure (and thus value) for the buyer. This is the best analysis I’ve seen posted on this blog or anywhere else. Agree. Jokes aside, it is a very interesting analysis otherwise not accessible to a private person looking at the real estate market with only the “help” of a Realtor. Thanks for informing and sharing. i’ve been wondering for a while where the geeked out, engineered numbers were. im super excited about the upcoming posts. it’s like chrimstas day and i can’t wait to open the the presents! Nice analysis and post. It presents a solid quantitative analysis in an easy to read format. I look forward to the future posts. 1) I suspect the delta between the actual median sold values and your estimate of value in the first chart may be evidence of the “stickiness” of home prices (we’ll see over time if they converge or possibly flip with market capitulation). 2) The best line that I’ve ever heard to summarize Irvine – “The city itself is extraordinarily homogeneous.” Where I come from we use the term “cookie cutter” but I guess folks who live in Irvine like their similarity. It amazes me that such a small percentage of the subset of housing stock (SFR – detached) is so uniform and fits tight parameters. We’re not in Kansas, Alabama, or Michigan anymore. I’ve been running a similar regression analysis. If what you are interested in are price trends, I believe Zillow Home index for your zip code probably follows a similar methodology. The dominant variables are square footage, lot size and age. There is a somewhat but less robust dependence on number of beds, that for most cases is captured by the previous three. Beyond that, I humbly defer to von Neumann’s admonition “With four variables, I can fit an elephant; with five variables, I can make it wiggle its trunk.” After all, even after you run your regression, you will end up in a standard deviation of predicted home value of around 9-10%. FYI, that property is not in Emerald Bay, otherwise you’d need to add another $1m to the price. It’s between Crescent Bay (best Laguna cove IMHO) and Shaws. Great area. Too bad the vacant lot next to it isn’t also in the deal. Right in front of that property is what the locals call “Contino Point” (named after an original owner) which one of the largest beach front lots in the area. Irvine McMansion or near ocean front property, walking distance to one of the best beaches in the area… hmmm. Choices, choices. Thanks for the correction. I updated the post. For as much as I like Irvine, I have a difficult time thinking most buyers would pick the Irvine McMansion over the ocean view home by the beach in Laguna. It depends on nationality and/or school aged children. Sending your kids to school in laguna beach is laughable for some. Specific Irvine schools are required for both proper upbringing and education. “Proper”? Seriously, are you that snobby? Last I checked, a school rated a 9 or a 10 in Irvine has the same rate as anywhere else in CA. Get a grip. Irvine schools are overrated. They are NOT Ivey-League (or Stanford/Berkeley) feeder schools. Maybe UCI feeder schools but anyone can get into UCI. Someone with great grades who went to a top school in Laguna or Aliso has the same chance of getting into a top college as someone from a top Irvine school. If anything, the lack of diversity in Irvine schools (mostly Asian) works to your disadvantage as the top colleges look for diversity and not 5 Asian kids from the same Irvine high-school who all play the violin (sorry for the stereotype). I think he is referring to some cultural preferences. Yes, even a private school would be unacceptable in place of the specific choice Irvine public school. It’s allows for the proper upbringing of values and education. The commenter above is wrong about feeder schools, a disporportionate number go to top schools. All it costs is your childhood and soul. All the dumb kids in Irvine must attend the same church that I do. I know quite a few college students, recent college grads, and recent high school grads that attend the same church that I do, and a “disproportionate number” (my statistical accuracy is at least a accurate as PR’s) go to CSULB, CSU-Fullerton, local JC’s, or no college at all. A couple go(went) to UCI, several attend(ed) private Christian colleges, and a couple more go(went) to USC/UCLA/UCSD/UCSB/CalPoly/Chapman. I know of ONLY ONE recent H.S. grad from my church of approximately 1,500 (~500 regular attendees) that is attending or has recently attended an Ivy-League-equivalent school. But, I do have to admit that the church I attend probably has a smaller percentage of Asians in the congregation than the overall population of Irvine. But I’m sure they will be able to afford a nice Irvine SFR. Exactly, you go to the wrong church for ivy leaguers and other top schools. It’s not your fault. You were born into it. Any data you can share on your Irvine public school feeder school claim? I also did not say “Top Schools” but Iveys. UCI as an example: Probably good chances to get in if you have great grades and are from an Irvine high school, but you have the same chances coming from a strong Capistrano school. When it comes to the real top schools, i.e. Iveys, there is no Irvine in sight: No Irvine schools in the top 100 feeder list for Harvard, Yale, and Princeton: http://www.electricprint.com/edu4/classes/readings/edu-eliteschools.htm or http://online.wsj.com/public/resources/documents/info-COLLEGE0711-sort.html . In conclusion, Irvine has good schools but they don’t justify the real estate price premium as it won’t make a difference when applying to College, so what’s the point apart from the lack of diversity (which I see as a downside). I don’t think you can prove your Capistrano school to UCI claim either. A relative of mine who was trying to get into UCI said that her friends who went to Uni had a better chance of getting in than she did (she went to a non-Irvine school). While anecdotal, the point is you can’t totally back up your claim that someone from a non-IUSD school has the “same chances”. However, this isn’t to say it’s only because the school is in Irvine is why the chances are better, it could mean that whoever is on a college acceptance board recognizes the quality of education at certain IUSD schools and will give the application more merit (like those who go to Troy or OCHSA). Just like employers will look at Harvard or Yale over less prestigious Ivys. Whether or not it justifies the premiums is irrelevant, it just has to justify the perception of parents who are willing to pay the premium. After all… it’s for the children. Anyone else notice that PR is just trolling with these comments? I don’t know the total number of students in the class. I don’t have anything from the other Irvine high schools. Plus a long slew of lesser-known colleges and universities, with varying numbers of acceptances. i have to agree with this observation. My niece who graduated from an Irvine HS is going to a private christian college. Some of her friends are going to local JC’s and some are going to UCI. On the other hand, my nephew from Ohio is going to an ivy league equivalent school. IVy League left a bad taste recently. Went to a meet the university recruiters night at Uni and as an experiment dressed up fancy looking with bling as I figured the Ivy recruiters would be swamped, and maybe I’d have a better shot of talking with them that way. Turns out each Ivy recruiters wanted to talk to me for several minutes and kiss up to me and my kid while mostly ignoring the underdressed parents asking about scholarships. Didn’t see them asking random student about what they liked to to study and their grades for the scholarship question parents. I felt like I was at a car dealership – it’s all about getting your money. Allure of Ivys is way down for me now – doesn’t feel like great value for money. I find it so amusing when people here get into arguments about how valuable the ability to attend Irvine schools is. the quality of Irvine schools is completely irrelevant. bms – I am not sure if I am reading you correctly. Do you think that the reputation of Irvine schools is not a big factor in the stickiness of the prices of Irvine homes? IMO, with no hard data, the Irvine school rep accounts for 95% of the premium paid for Irvine homes. That is not to say I think the premium is worth it. Fair question. I should clarify that schools are completely irrelevent to the question of whether Irvine is overpriced. As to the stickiness issue… I don’t think it’s a big factor in the stickiness, because we’ve seen the same stickiness in other premium areas that are valued for reasons other than their school districts. I guess you could counter that by saying that the schools are the main thing that makes Irvine a premium area in the first place; but I don’t think most people believe that. The schools are just one factor out of many… and if they were the overwhelmingly dominant factor you’d see much more of an effect on Irvine rents. The premium for owning an SFR in Irvine is a culmination of what capitalism works summarizes below. The premium starts with a rental parity base and then includes rental inflation plus the emotional and intrinsic ethnic status value of owning. Future expectations always impact current value for choice assets. Out of the factors capitalism works list, I imagine Irvine public schools represents 70-80%. bms – Seriously, what does Irvine have going for it besides the schools? Awgee, I would say central location and proximity to Irvine jobs is the secondary factor. In addition ethnic factors (community, restaurants, super markets, etc) but you could say those are due to the schools. Or is it the other way around? Either way it’s related. It doesn’t hurt that savings and cash go hand in hand with this. I’d have to agree with PR (*gag*) that proximity to jobs is kind of a big deal. I think I read that Irvine has about twice the ratio of jobs to residents as OC as a whole, or something like that. Are there other communities which have the same proximity to jobs and if so, have prices of those communities been as sticky as Irvine? I question how much of the stickiness is attributable to the schools and how much to other factors. And I guess the same can be asked of other communities with good school reps. Living in Irvine would be a much better commute for me, but it is too dense and my kids will be attending a private school anyways. Irvine use to be attractive to me, now not so much. And on agreeing with PR. I wouldn’t know. He now has so little credibility that I no longer read his comments. 1. They aren’t into beach life (if you are wearing a welding mask for an afternoon walk, you’re probably not all that interested in relaxing at Main beach). 2. Schools (as PR reported). Most of the LB residents I know send their children to private schools. Foreign buyers are far more likely to send their children to publics, and pick their locations accordingly. 3. Critical mass of like people. Laguna Beach does not offer the “diverse” cultural mix that one finds in Irvine. For someone moving from a foreign country, it is nice to have a sizeable population of people with a similar cultural background. 4. Access the works. Irvine is the land of the worker bee. Commutes under 15 minutes are highly appealing. This is one of Irvine main selling points. 5. Corporate relocation services often put workers relocating to OC in Irvine. The large quantity of rental units eases the process. Many generations of wealth. These are mostly asset purchases, not income based. Chances are many of the homes will be passed from one generation to the next. This is Irvines future as it attracts a specific segment. Laguna Beach has no Asian markets. deal breaker. Too bad graphrix is no longer around to see it. Great post… but doesn’t bode well for me who was hoping to see 2003 prices in Quail Hill. Yes, it doesn’t bode well if your looking for those 2003 prices today. I don’t see how the data supports the conclusion that prices won’t bottom at or below there; only that it hasn’t happened yet. I was basing that on the commentary that flight to quality will keep the premium areas premium. Does anyone still think that Tapestry SFRs in QH that are selling for $1m+ now will go back to mid $700ks? Even Olivos SFRs that are skirting mid $900k… will those drop another $200k in next 1-5 years? “Has kept” and “will keep” are two very different things. The data presented support one and not the other. We’ll get a good proxy of the current strength of Irvine premium area pricing by observing the sales process in Laguna Altura. Personally I find it very unlikely that QH SFR prices will drop to ’03 levels. Why not? This is not a challenge, but rather an interest in your opinion. The stickiness of Irvine home prices suprised me. In real terms 2003 prices may already have been realized. In nominal terms it may never happen, they’ll first need to get back to 2009 nominal price levels. I was told by many bears on the IHB that it would be in real prices, not inflation or mortgage rate adjusted prices. In fact, we’re supposed to party in Irvine like it’s 1999. As usual you are correct, I was also told many times that the market was still going down after Jan 2009. Thank god for revisionist history. Facts are shown clearly, the market is still above jan 2009. No. What you were told that Jan 2009 was not the bottom. There have been periods of both price increases and price decreases since then. The data regarding whether we have already passed back below the Jan 2009 mark as of right now is inconclusive. I won’t defend the claim that nominal prices will return to 1999 levels. I’ll simply point out that it’s clearly not the consensus opinion of bearish commenters here. Then what is the consensus? I can go back and necro-google-necro several posts that said Irvine is going to drop over 50% and that we’ll see pre-2003 prices, even as low as 1999 levels. When a commenter says that an 1800sft home that’s listing for $600k is ridiculous and it should be half that price… guess what… that’s Irvine 1999 pricing. There is no concensus prediction as to exactly how much further prices will decline. As you say, some individuals have made very aggressive specific predictions that go beyond what most of us think is likely. What price declines for Irvine are you banking on? When will you be pulling the trigger and buying your dream Irvine home? Do you have a specific need for 3 car garage, view, and floor plan? I hope not. Right… because my ability to afford such a home is completely relevant to the validity of my opinion on home prices. Good to see you mixing in some ad hominem non-sequitors in with the usual heavy dose of straw-man. No, in fact if you don’t need those attributes it will be easier for you to obtain the price decline you are looking for. The hedonistic data will soon show that those attributes in Irvine command a premium on the premiums premium. But you didn’t answer what price decline are you banking on? I’m not banking on any particular number. If/when prices make sense compared to rents, I will no longer anticipate them declining further. IR & Jaysen: I have to chime in with all the other statements of support and thanks for this additional data set. That said I hope that the Blog doesn’t veer too far into fact-driven, wonky analysis, at the cost of ignoring realtor lingusitic malfeasance. I’m sitting here trying to picture a glorious, custom “BBQ/pool/jacuzzi” in my mind. The possibilities seem endless. I concur with SacBoomer. I read this blog for a mixture of entertainment and “education”. If I want to drown in a sea of data dumps, I will just go to work. We are planning on doing one per week. Like you guys, I find that all work and no play makes for a dull blog. You can get pretty close to late 2003 prices in QH if you want to buy in Jasmine or Casalon. Like the hedo-data… I’m more interested in the detached SFRs. Your analysis indicates that it includes new homes sales, where is this sourced from as it seems the MLS is lacking in that kind of data? You will be thrilled when you see the data on the increase in value associated with 3-car garages. Apparently, you are not alone in your love for under-roof parking and storage. Other than the extra storage space, the thing about 3-car wide garages (as opposed to tandem) is that usually translates into a wider lot which is a premium in itself compared to today’s new homes that are not only narrower but actually lack their own driveways. How The Irvine Company think they can get away with charging $1m+ for homes with only 2-car garages and no view lots is beyond me. The core data comes from a number of sources (you’d be surprised how many gaps there are in any one source), but, more importantly the model is built using only *resale* detached SFRs. I believe the text of the blog notes “resale homes”, but if you and/or others interpreted it to include new homes, I might need to more explicitly state that filter from the beginning. Because Irvine experienced something of a building boom from 2000-2007, the percent of total sales represented by newer homes has also increased over time. It seemed to indicate to me that you were including sales of new homes, but I see it’s “newer”. Wouldn’t including the new home sales change things a bit considering that they were a significant portion of sales, especially in 2010? @IHO: Good question. Of course, the best way to answer it would be to recreate the Irvine hedonic model after including new home sales (but introducing a new variable called “newsale” with a 1/0 flag). The hedonic model would end up finding the premium for “Woodbury-New” vs “Woodbury-Resale” which would be interesting in and of itself. It’s hard to predict exactly how the inclusion of new home sales would affect the overall trend and the coefficients of the resulting model. Based on similar work in the past, I would speculate that excluding the new home sales creates a model that better fits the resale value of SFRs. New homes would likely have a premium for being new, and the sales data might be clouded by builder incentives that are either off-the-books or rolled into the financing. Of course, those distortions can also occur with resales. This is great stuff. The statistical analysis seems like a very clever way to make some sense of the limited data available for a sub-market like one city. Way better than just looking at stuff like median price per square foot, which is usually the best you can get for a single city. I have to admit though, at the end of the day I really only trust paired sales data like Case-Shiller. Because individual homes are so heterogenous in desirability, I want to see the true apples-to-apples comparison that only something like paired sales can provide. @bigmoneysalsa: paired sales is another excellent approach for home price trends. It gets harder to pull off as you make the geographical area smaller. However, we are also currently investigating if the Irvine SFR home sales dataset might work for a repeat-sales model. I think it would be an interesting exercise to compare the trends based on median, PPSF, a hedonic model, and a paired-sales model. The “saving grace” (analytically speaking) of Irvine is that many neighborhoods have a high frequency of repetition with respect to floorplans and models. Thus, we might be able to construct a paired-sales approach by using model matches instead of exact addresses. By relaxing that constraint, we would probably offset any degradation in the model due to the smaller dataset. Anybody who pays almost 3M for this place is absoultely, positively out of their mind. 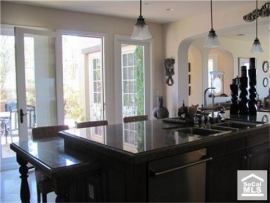 It’s a nice 4400 sq ft tract house in Irvine. We hear all the foaming out of the mouth about Irvine schools, you can buy Irvine houses for 20% of this asking price and send your kids to the same schools. When you get into the rarified air of 3M properties, there needs to be some serious draws. Ocean close, ocean view, on the water, etc. If some fool truly pays the asking price, he/she will be guaranteed NO appreciation for at least a decade. Have fun paying that mortgage and those taxes! I agree that this particular property is overpriced. I think most properties in Turtle Ridge and Irvine still are (by how much, who knows). But, this house does have a view (looks west towards the ocean and Catalina Island); it is located in the hills. So, it is vastly different than 90% of Irvine homes. So it is not just a 4400 home sitting on a flat lot in a large housing development 15 miles from the coast. It is much more like a Newport Coast home. I think the comments often go over the top. Irvine is still a very nice place to live. The schools are good. This neighborhood feeds into Uni High and the idea expressed above that at best Uni High is just a feeder school to UCI is just not in touch with reality. There are also commuter issues. Prices along the coast further south are attractive, I have been tempted to move in that direction. But that’s a long drive to the 133/PCH if you are working in the Irvine metro area. (And, no, that isn’t my house but I do live in the neighborhood). However nice and ‘exclusive’ you think that turtle ridge is, it is not newport coast. It means you have an ocean view with good weather. That and your kids don’t have to go to school in Laguna Beach. The 4 mile ocean view is probably worth something, but not the premium that is being asked. I doubt anybody who can afford a 3M house sends their kids to public school. I imagine only exclusive private schools would even be considered. The high end was spared so far, don’t know how long that can last. What exclusive private school? I guess they’ll have a limo chauffeur them to Pasadena Polytechnic or North Hollywood Harvard Westlake; maybe Pasadena Westridge if they want the all girls experience. There are ZERO elite private schools in OC. Uni or Fullerton Troy are the best choices. For $3M they could buy a 1 acre spread in Los Altos Hills in the Palo Alto Gunn school district. Now you’re talking a bona fide feeder school for Stanford, or they could nut up $40K/yr for Harker and guarantee entrance to any school they want. What’s the mathamatical formula for the pricing and does it have predictive power for the near future or for a year ahead ? They clearly should have asked for $700/sqft. Idiots.